The Shenandoah Valley Civil War Museum is a historic building with graffiti from both Northern and Southern soldiers which also houses a nationally recognized collection of over 3,000 Civil War artifacts. 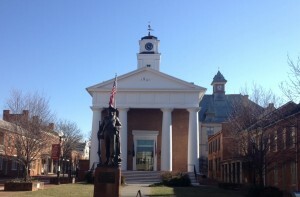 Situated on the Loudoun Street Walking Mall in Old Town Winchester, Virginia, this Georgian style court house was used as a hospital, barracks and prison by both sides during the War. Admission for adults is $5; children and groups of 10 or more are $3 each. 10% discounts are giving to seniors, military, college students, and AAA members with ID. CLOSED Thanksgiving Day, Christmas Day and Easter Sunday.